Published on Tuesday, May 11, 2010. This article appears in the June/July 2010 issue of American Craft Magazine. 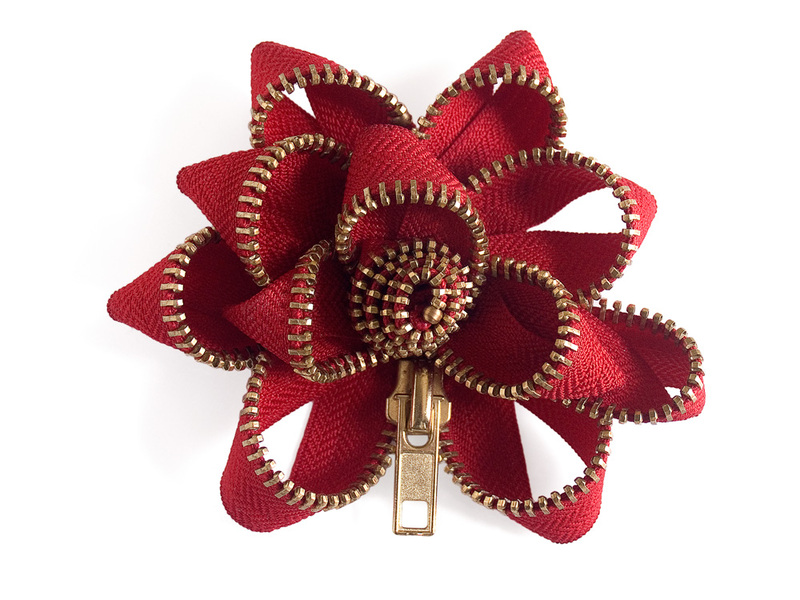 Kate Cusack's Red Pin with Gold Teeth. Photo Frank Cusack. Kate Cusack gets some of her best creative inspiration at supermarkets, 99-cent stores, or wherever products are displayed in bulk. Seeing household items stacked together makes her visualize them afresh, out of context, as something other than what they are, or do. "Whenever I see anything in multiples, it's exciting," says the 30-year-old, Brooklyn-based artist, who divides her work between jewelry, sculpture and costumes for theatrical productions. "What's interesting to me is the use and transformation of materials." In Cusack's hands, plastic food wrap magically morphs into a series of towering, luminous Marie Antoinette-style wigs for a window display at Tiffany's Fifth Avenue store. Bubble Wrap becomes a chic cocktail dress (imagine sitting down in that), and sponges a fetching patchwork ensemble for the fashion-forward housemaid. Zippers spiral, coil and undulate into sophisticated sculptural bracelets and neckpieces, or bloom into playful boutonnieres. Humor and whimsy are important to Cusack, part of why she enjoys turning humble, unlikely objects into polished, elegant works of art. "When I transform an everyday material into something elaborate, it reminds the viewer of the power of imagination, the joy of discovering a new view of something that would have otherwise been overlooked," she says. Besides, she adds, there's something deeply liberating about working with expendable stuff. "There's not a lot of baggage. If something is essentially trash, you don't worry. The real creativity can come out." As the daughter of artists (Margaret, well known for her fabric stitchery, and Frank, a photographer and graphic designer), Cusack grew up fascinated, like them, by the process of shaping one thing into another: "My father says we're a family of manipulators in that we'd prefer to start with a material and create something entirely new with it." She did her first experimental pieces in plastic wrap and sponges as a student at the Maryland Institute College of Art, and later earned her MFA in costume design from the Yale School of Drama. Her background and training have enabled her to pursue a multifaceted career, moving easily within the overlapping worlds of fashion, theater and visual art. Cusack's biggest commercial success has been the zipper jewelry, sold in boutiques and museum stores nationwide, and worn by celebrities such as the singer Fergie and the model/actress Yaya Dacosta of TV's Ugly Betty. In addition to liking the idea of the fastener becoming the fashion statement, she finds the zipper to be a medium of surprising variety and versatility. There are standard and luxury brands. Seams come in a broad spectrum of fabrics and colors. Teeth can be plastic or metal, in different shapes, sizes and finishes. A slider can be commonplace or a tiny work of art. "I've learned so much about zippers," Cusack marvels. That evidently includes how to render them extraordinary. 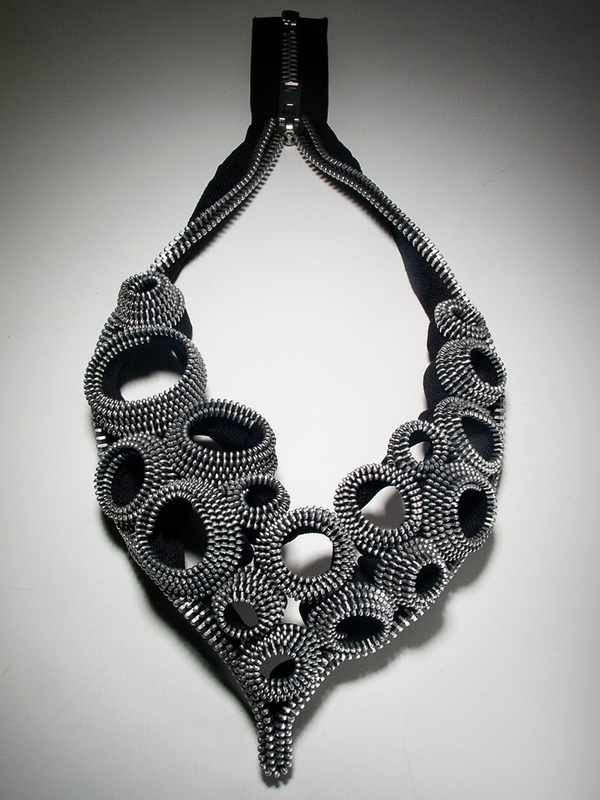 Edvard, neckpiece of spiraling and coiled zippers. Photo Frank Cusack. Funnel by Kate Cusack. Photo Frank Cusack. The thread that connects Meredith Brickell’s ceramic and mixed-media sculpture is observations of place. Stephanie DeArmond's sculptural letterforms are not easily defined. Jeremy Mayer transforms typewriters into arresting anatomical sculpture. Inventive jewelers are giving people the means to express themselves in a big way, creating emphatic, even boisterous pieces. 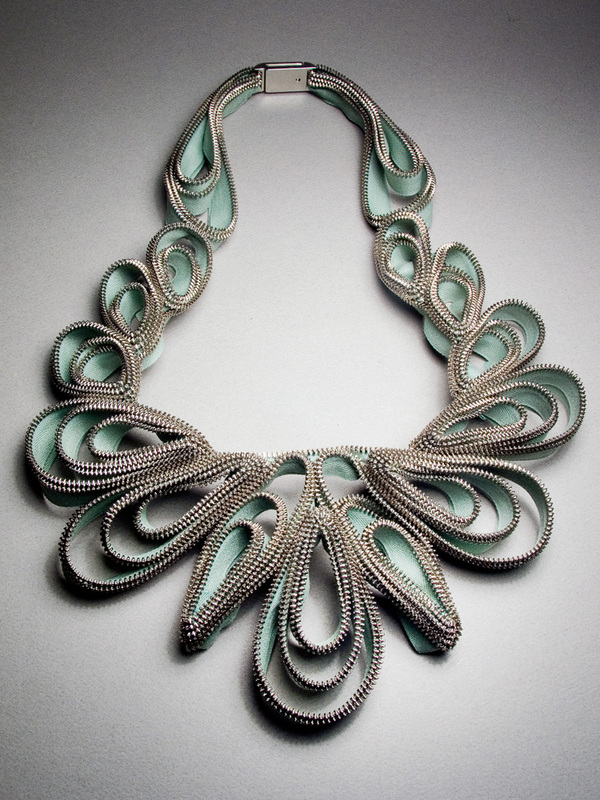 Shonquis Moreno reports on this larger-than-life neckwear trend.